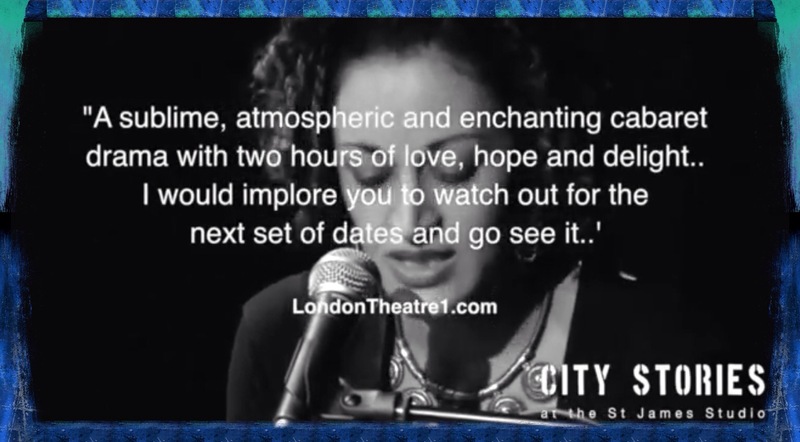 As you know it’s been my privilege and pleasure to have a quote from my review of City Stories used in the trailers for the new shows 10-12th February and on the St James Theatre website. 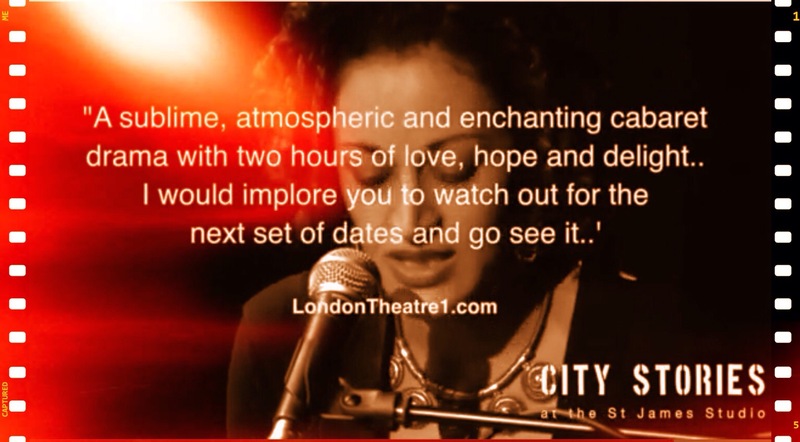 City Stories is a new type of Cabaret Drama, a sequence of interwoven love stories and a love letter to London. Written and directed by award winning playwright James Phillips (The Rubenstein Kiss, Hidden in the Sand) and with original music composed by singer-songwriter Rosabella Gregory (winner of New York Songwriter’s Circle Song Contest), City Stories is a magical journey through a magical city. These are the first dates in a year long expanding residency for the City Stories Company, with new stories and new music added to the existing repertoire. The company include: Alexander Hanson, Gary Kemp, Will Keen, Sally Dexter, Julian Ovenden, Sarah Quintrell, Louisa Clein, Daphne Alexander, Phoebe Sparrow, Tom Gordon Gill, Yolanda Vazquez, Martin Turner, Scott Handy, Karina Fernandez, Uriel Adiv and Peter Bradley. The new shows promise to do the same and I for one can’t wait to return! I hear there’s a New Story joining the repertoire ‘Carousel’ which will feature Alan Cox, Louisa Clein and Tom Gordon, and brand new music from Rosabella Gregory. There is also a New Cast member Jay Villiers joining Phoebe Sparrow returning in the story “Pearl”. I promise you the only disappointment you will have this year is if you miss out on the opportunity to witness this outstanding evening of entertainment! I was promised an evening about tales of love and magic in London and I was not disappointed. St James Theatre Studio is a perfectly formed bijou character filled auditorium, with its bar, tables and upstairs lounge swivel chairs, it created a charismatic setting for this production. So as I took my seat, the scene is set and the ambience created. What followed was a sublime, atmospheric and enchanting cabaret drama, with two hours of love, hope and delight. The evening was divided into five different pieces with Rosabella Gregory playing the piano beautifully, both underscoring and conjoining each story. Narcissi with Sarah Quintrell with Uriel Adiv. A tale of great love – the acting and timing was just divine. The romantic in me found the thought of a chance meeting of two people who returned time and time again to the same place, just to see one another, absolutely charming and a great opening. Occupy with Scott Handy and Emily Bruni. When I looked at the programme beforehand I wondered what this piece could be about and no amount of surmising would have made me think of this. This was thought-provoking. A tale of two people and a letter; not just any letter, but one sent to St Pauls to add to the other unanswered questioning letter. It took you on a journey of questioning belief and demanded your utmost concentration and desire to know how this story ends. The characters created and portrayed were mesmerising and the music haunting. Lullaby with Daphne Alexander with Sarah Quintrell and Uriel Adiv. Appearing to be about sleep and yet in so many ways so much more than that. So many questions arose from this piece that at one point I actually found myself holding my breath, as I was so totally engrossed with the story and the enchanting music. The Great Secret – Louisa Clein with Emily Bruni and Uriel Adiv . The interesting and engaging opening to Act Two and penultimate piece was fascinating. There is no staging to any of this and the picture and scene is set by words alone. The visual description and brilliant acting means that any prop or scenery is superfluous to requirement. You are in the coffee shop or attending that party although you are just sat in the auditorium, just an onlooker and yet feeling you are within at the same time. Pearl with Phoebe Sparrow and Martin Turner. The last story told of finding love, losing love, and not realising you are loved and can love again. Superbly acted and completely captivating, it was a pleasure to watch. In essence this evening delivered exactly what it promised, incorporating both the direction and writing of James Phillips. I came out of the show feeling empowered to go and take on London and love. Feeling that love does conquer all and to love is to be loved, and to fall in love with this city and its wonderful magic. I would implore you to watch out for the next set of dates and go and see it. This show, cast, composer, writer and director are a match made in heaven!